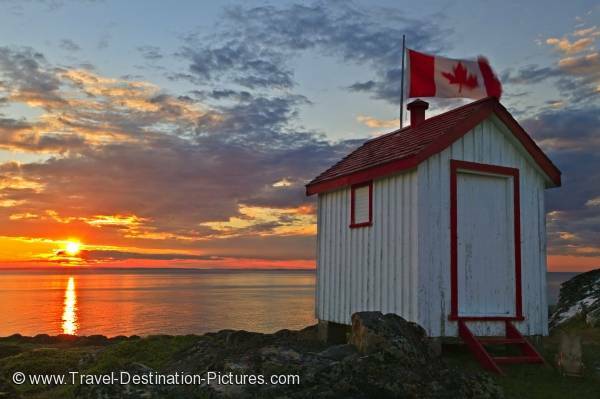 The Canadian flag flies from the roof of an outhouse during a bright sunset over the Altantic Ocean, Newfoundland. Quirpon Island is considered Iceberg central in Newfoundland, and the Quirpon Lighthouse Inn is situated right on the shores of Iceberg Alley, the local playground for marine mammals such as Humpbacks, Minke whales, and Orcas. From Quirpon Island you can enjoy whale watching excursions or hiking the island. There are activities available from sunrise to sunset. In the evenings enjoy the classic Canadian hospitality of your hosts and a satisfying supper. Picture of a shed with a beautiful sunset view along the coastline of the Canadian provence of Newfoundland.